Editor’s Note – Be sure to check out the retesting of this drive to show the numbers it should have gotten in this review: Re-Lighting Patriot’s Inferno. 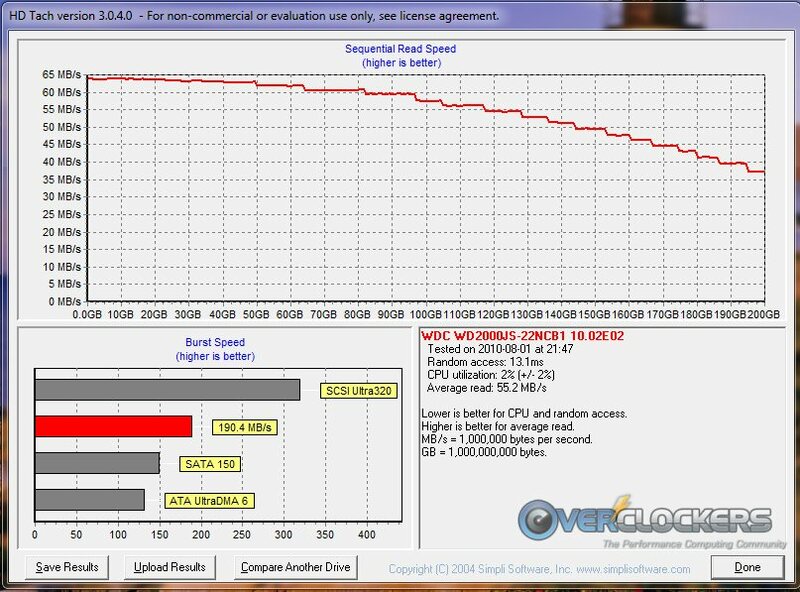 “A solid state drive (SSD) is the greatest single upgrade you can perform on a modern computer.” At least that’s what we’ve been told at one time or another. SSDs have come a very long way since their first release. They’re more reliable, larger and most importantly, their cost-per-gigabyte has come down. 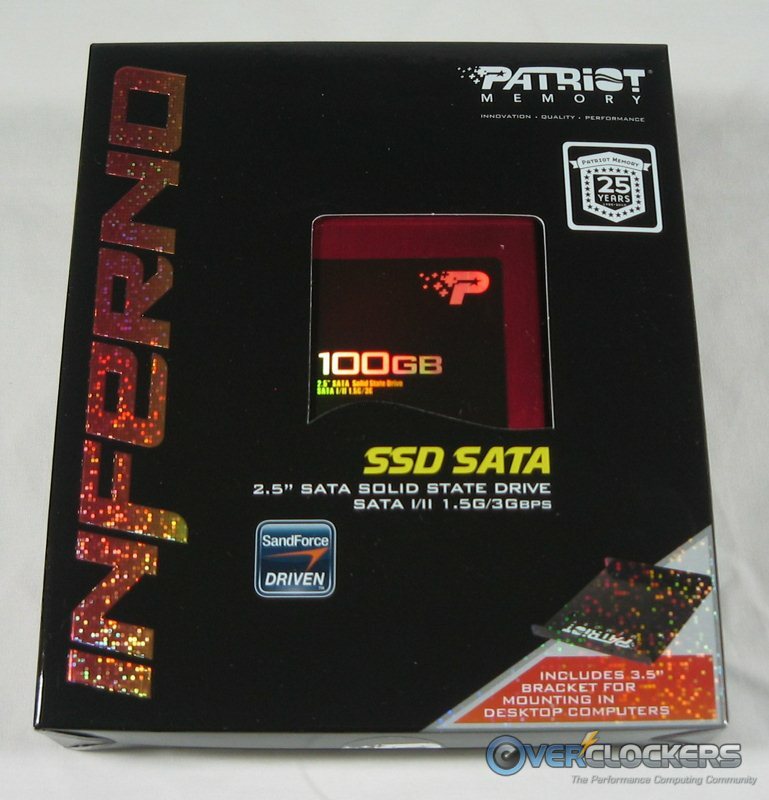 Today, we’ll see if that modern day adage is true as we examine Patriot’s high performance Inferno SSD. 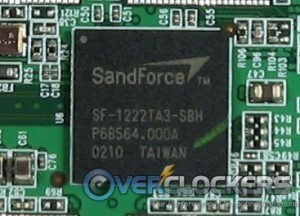 Sporting a controller from now-popular SandForce (model # SF-1222), this unit is marketed as a 100GB model. Due to its controller, that means it is really a 128GB drive with ~28% of its NAND space allocated for spare area. This is borne out when you first format the drive and its total available capacity is approximately 93.1GB. 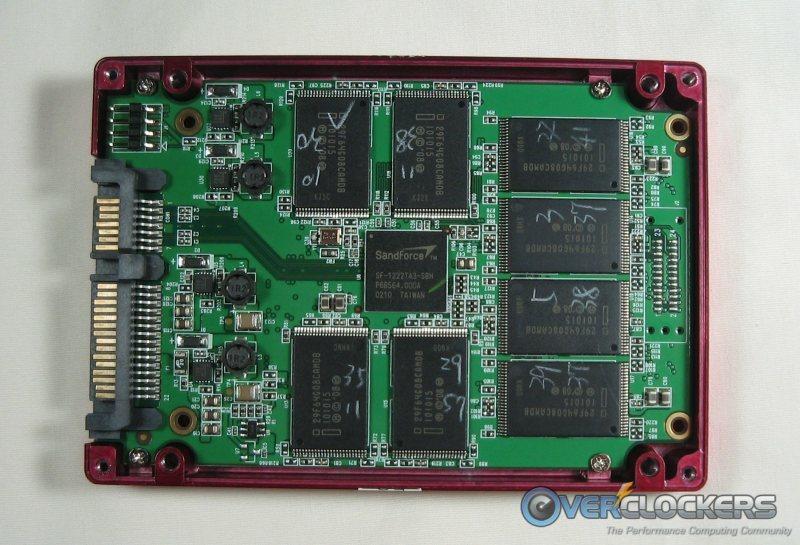 This excellent article at Anandtech has a detailed explanation of what purpose this serves, as well as the step forward SandForce has made with some drives. When you write data to a SandForce drive the controller attempts to represent the data you’re writing with fewer bits. What’s stored isn’t your exact data, but a smaller representation of it plus a hash or index so that you can recover the original data. This results in potentially lower write amplification, but greater reliance on the controller and firmware. 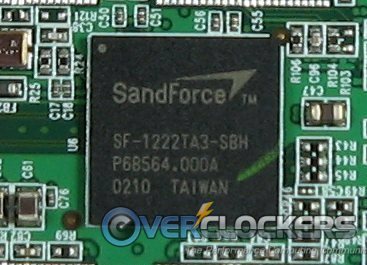 SandForce stores some amount of redundant information in order to deal with decreasing reliability of smaller geometry NAND. The redundant data and index/hash of the actual data being written are stored in the drive’s spare area. What you get in return, in theory, is higher performance and more reliability out of your drive. 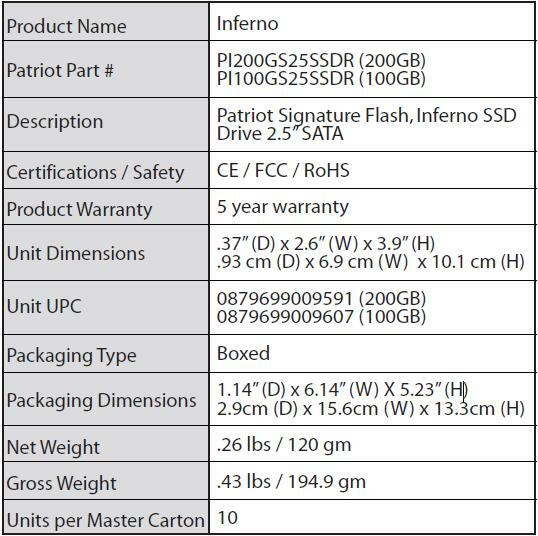 Patriot very recently announced the availability of 60GB, 120GB and 240GB models of their Inferno drives, so it would seem they will be rolling out the new SandForce firmware with the mentioned 13% over provisioning in the near future. Let’s see what Patriot says this drive is capable of. **Capacities stated are unformatted. The total formatted capacity for the drive will differ, depending on the operating system and file system used. It sure sounds like a top performer. 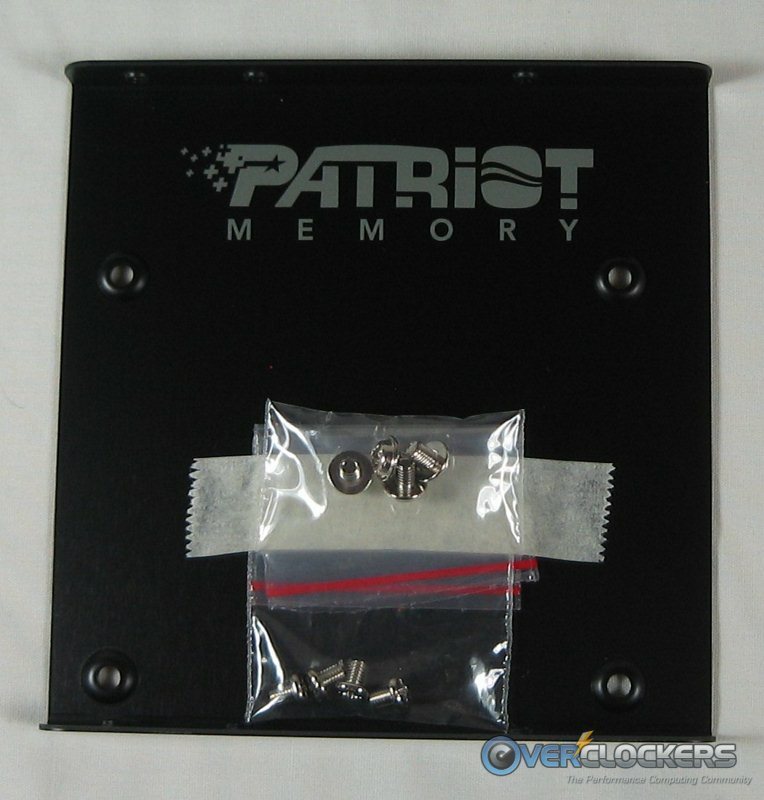 Patriot likes to talk about their warranty (indeed, they did so in a recent issue of Computer Power User), and it is definitely impressive at five years. By comparison, Corsair, Intel, Kingston and OCZ all offer three years. 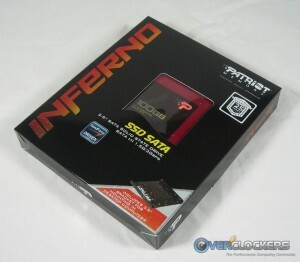 The Inferno comes in a well put together package. There’s the outer cardboard box and the hard plastic container to protect the drive in transit. It will need a bit of padding of course, but should survive a journey quite easily. 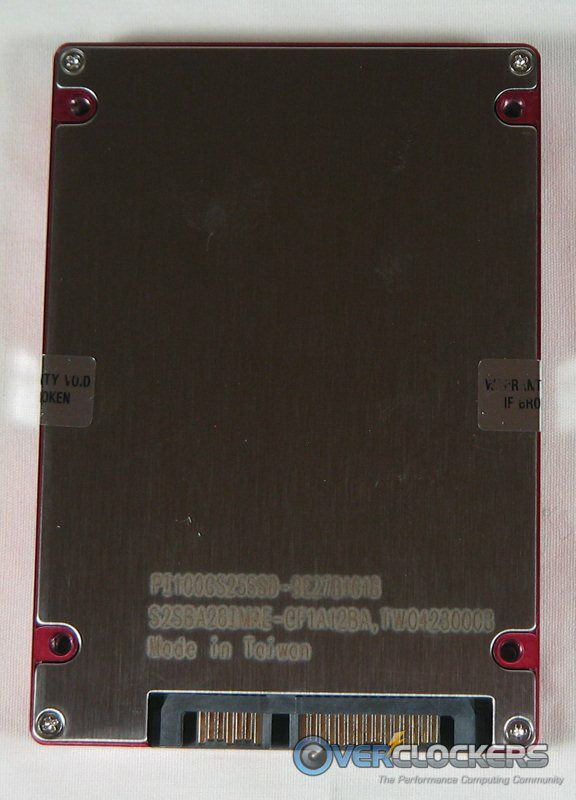 Pulling the drive out of its case, we are met with a standard 2.5″ SSD size, but this drive is far from typical. The red case and even the sticker on it present the drive very well. Should the performance be up to par (we’ll get to that in a bit), this would be a superb display piece in a red-themed build. Installation is straightforward; it is a hard drive after all, they can only be so difficult. If your case has an SSD mounting mechanism as a lot of newer cases do, you can go that route. 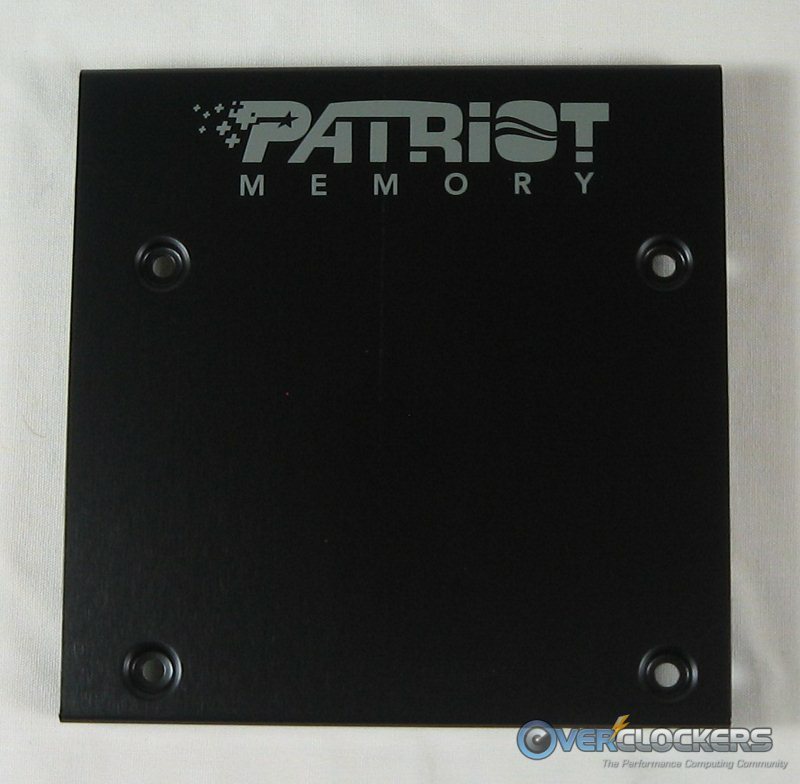 If not, Patriot does include a handy mounting plate that will adapt it to a standard 3.5″ drive bay. Take note if you have a tool-free device for mounting your hard drives – it may not work. I tried the 3.5″ adapter in both an NZXT Tempest EVO and a Cooler Master CM690 II Advanced. While NZXT’s mounting brackets worked fine, the Cooler Master bracket did not mesh with the adapter. The pins in the tool-free mount were too large to fit in the screw holes on the adapter, which pushed them out and didn’t allow them to slide back into place. The fix is easy though – just remove the tool-free mounts and replace them with screws. Or, if you have the CM690 II Advanced, use the correct bracket that’s tailored to fit an SSD. It does require screws though. Opening the drive, you can see the Sandforce SF-1222 chip surrounded by the array of MLC NAND flash it controls. Looking a little closer, we have the SF-1222 itself. Enough looking around though, let’s get down to the brass tacks! 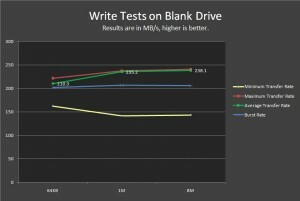 We used several benchmarks to measure drive performance. Legit Reviews uses a benchmark suite similar to what you’ll see in this review. 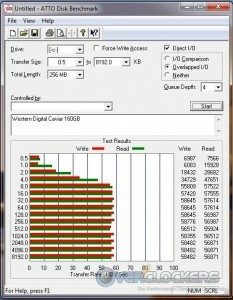 In the analysis of this drive’s performance, I’m going to be basing a lot of my comments on how other drives performed in their excellent review of the Corsair Force Series 120G. 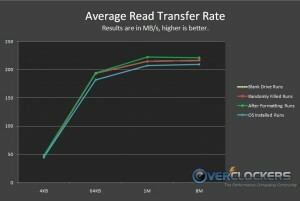 It’s a good read and shows a nice swath of the current crop of SSDs on the market. 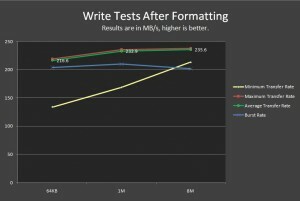 To start with, let’s have a look at the HDTune benchmark, which tests read & write speeds across the entire drive, showing the minimum, maximum and average read/write speeds. These tests were run four different times, under different conditions. The first was on the bare, just opened, blank drive. After that, the drive was filled with random data and the tests were run again. Then it was formatted to see how it would recover and finally the test was run one last time after installing Windows 7. Read speeds were tested with four data sizes, 4KB, 64KB, 2MB and 8MB. The data labels shown correspond to the average figure. Before getting to the numbers, there is an important point to make here. SandForce does not appear to have any sort of application currently to manually TRIM one of their drives like Indilinx and Intel do. Neither of those work on a SandForce drive (I tried). I asked Patriot and they have no application to supply that will do so. With this in mind, I would strongly suggest only using this or any SandForce based drive with an OS that supports TRIM, at least until they do come out with an application like that. These are limited to Windows 7 or any Linux distro that uses kernel 2.6.33 or later. Of course, the reason all of those were run was to see how the drive compared under different conditions. 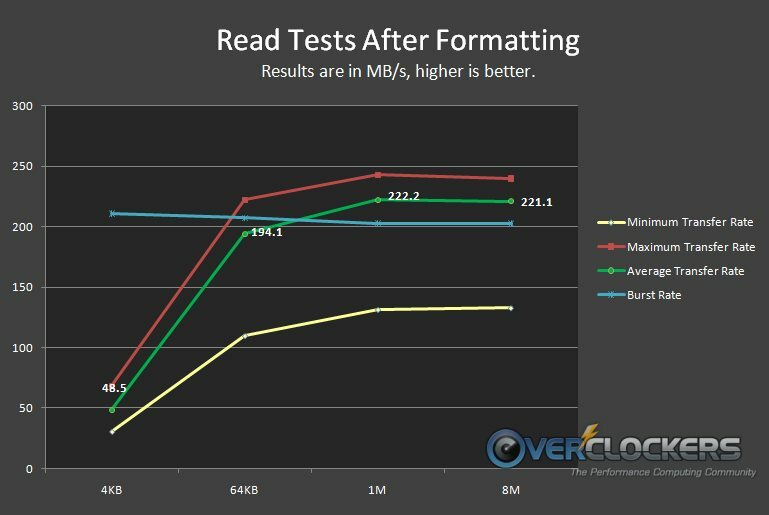 Here are all of the average reads compared against one another. So, while the drive did suffer a little bit of performance loss when full of random data (as expected), it gets that performance right back after a good formatting. The results were so close the blank and formatted lines are completely overlapping. Performance goes down a little bit when an OS and complement of programs are installed (approximately 35GB of space was used for the install and accompanying programs), but not by very much at all. There are two deficiencies when benching writes with HD Tune. First, it won’t test 4KB writes for some reason; it crashed the program each time. Second, since it tests writes across the whole drive, it’s not an option to test with an OS installed. That said, it’s still a solid metric for the rest of the sizes tested and for seeing how the drive copes with the random data. Here is how it performed under each of the three conditions. So, as expected it lost a little bit after being filled with random data, but gained it back after a format. Even so, the speed lost was rather minimal, so score one for the Inferno! Since part of our goal is to explore how much of a difference an SSD upgrade would make, for the next benchmarks I’m going to include a result from a several-years-old Western Digital Caviar 160GB HDD underneath the SSD bench. HD Tach is as much of a test of the drive itself as you can get, separating it as much as possible from the surrounding hardware and software environment. Our version of HD Tach doesn’t show write speeds, a fact which we hope to remedy by the next review. 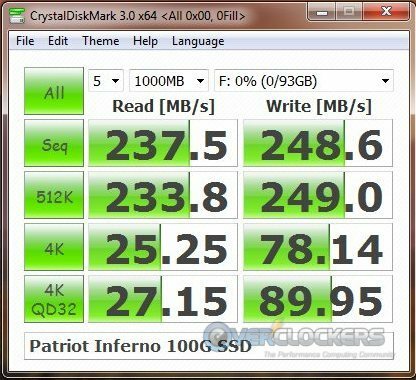 With an average read of 241.2MB/s and a burst speed of 240.3MB/s, the drive definitely shows off some of its muscle here. The dip you see was consistent through multiple runs, as were the results, and seems to just be a quirk of the drive. 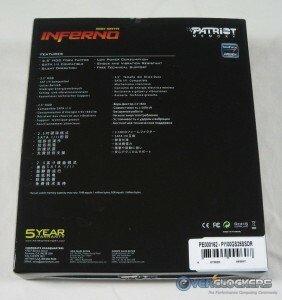 In this test, the Inferno is a very strong performer and among the top of the pack. 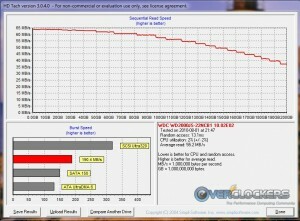 By comparison, the poor HDD maxes out at about 65MB/s and goes down from there. An oldie, but a goodie, ATTO does a good job of showing how a drive will perform from a tiny data block (a mere .5KB) to a larger one (8MB). It tests both read and write speeds and lists the results in bytes/second. 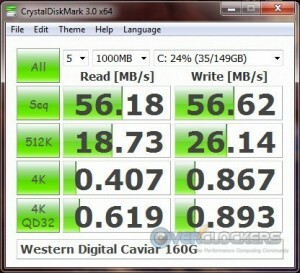 This drive, like many SSDs shows greater performance once you pass the 64KB mark. Above that, results hovered right around 250MB/s write speeds and 243MB/s read speeds. 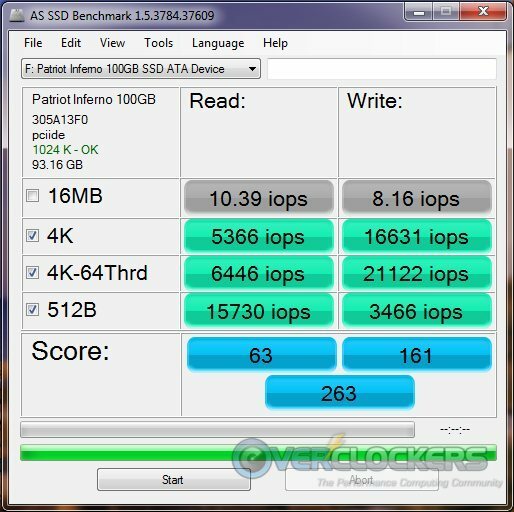 These aren’t king-of-the-hill numbers, but neither are they anywhere near the bottom of the SSD offerings out right now. Compared to other SandForce SF1200-based drives though, they seem to be lagging a little behind. 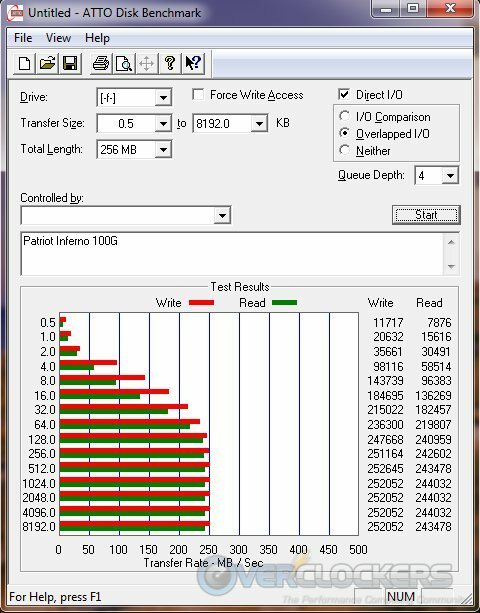 Our HDD, while maxing out a little earlier than the SSD at 32K, continues to lag way behind at about 58MB/s read and write speeds. CrystalDiskMark shows how a drive performs under various conditions, with the default configuration testing how it copes with random data. Not horrible numbers, but not awe-inspiring either. As a drive in your system, it will still fly, but synthetically benching the sequential read results with random data are just not pretty with this bench. I fear the competition will aim a little water at the Inferno when looking at this metric. On the bright side, sequential writes and strong 4K performance make it look a whole lot better. When using CrystalDiskMark, you can select options for the bench to measure not random data, but all 0’s and all 1’s as well. When not faced with random data, the Inferno blazes on like it’s nobody’s business. The HDD? The Inferno left it smoldering on the side of the road a long time ago. 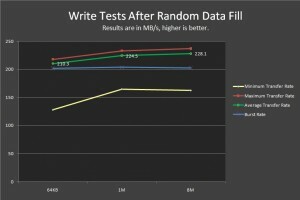 AS SSD is another great tool for measuring numbers with random data. 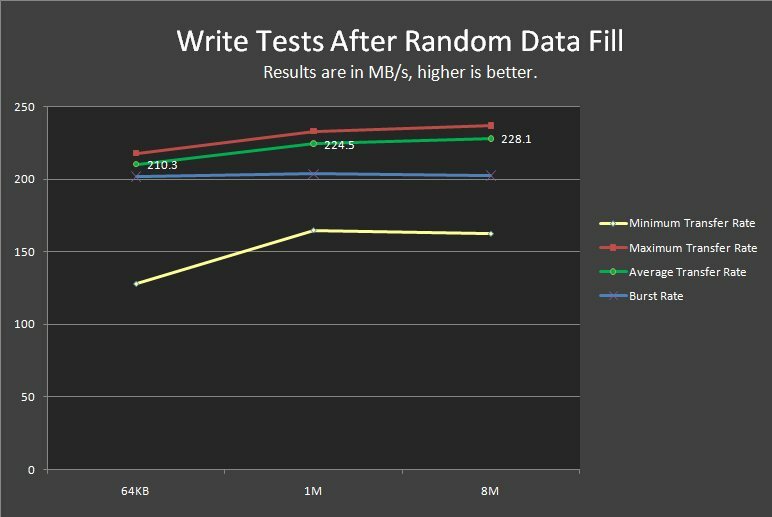 The first screenshot shows the bench as measured in MB/s and the second as measured in iops (16MB was run, but the was box un-ticked accidentally after the run). Yet again, the Inferno’s sequential numbers aren’t that great. It does well for itself and out-performs a lot of other drives, but you won’t see it setting any sequential read / write records. Fortunately, just like CrystalDiskMark, this drive shows stronger 4KB performance than many of its contemporaries, putting it right back at the top of the pack. 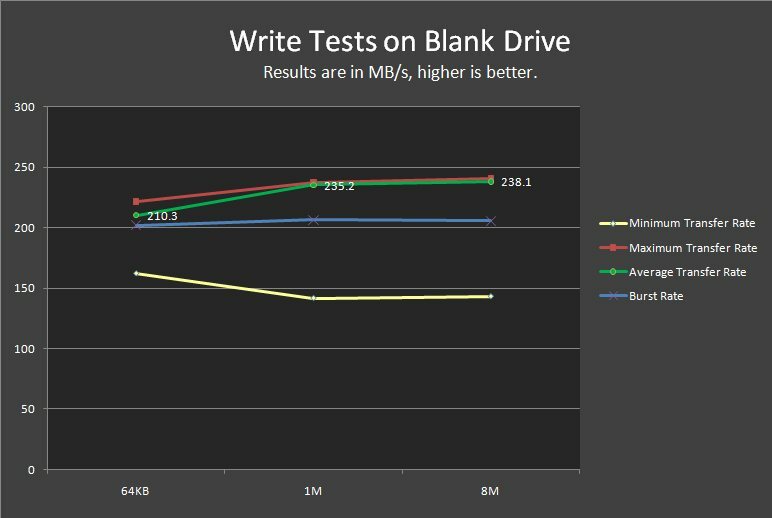 So AS SSD is a mixed bag – great 4K performance, excellent access times but not so great sequential reads and writes. 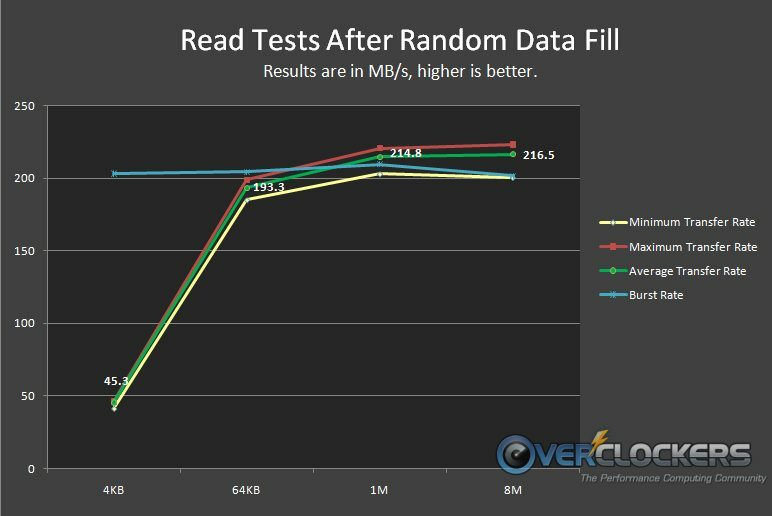 Thankfully for the end user, 4KB random reads and writes are one of the strongest indicators of real-world performance out there and that’s a place where this drive shines. Sigh; that poor, poor HDD. It’s thinking of seizing up out of humiliation. …13.945 seconds. Wow, what a difference! Amazing really. 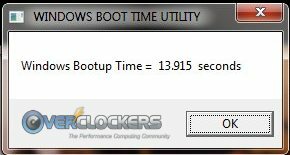 That’s 25.8% of the original boot time, meaning it takes four times as long to boot into windows with the HDD as opposed to the Inferno. 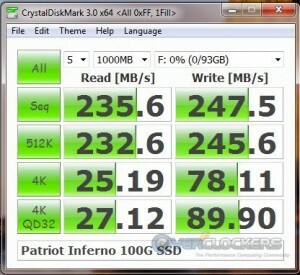 Since that time, I’ve used this SSD for a little while to see how it ‘feels’ in daily operation. Night and day would be the best description of coming from a standard platter HDD. I have seen the light and it is good. Very good. 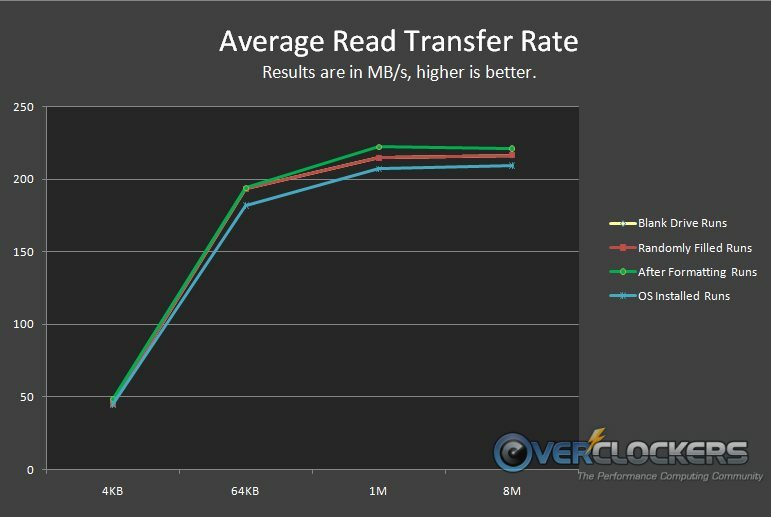 The not-so-old adage that an SSD is the best upgrade you can perform on a modern system (that only has a platter HDD) is absolutely correct. 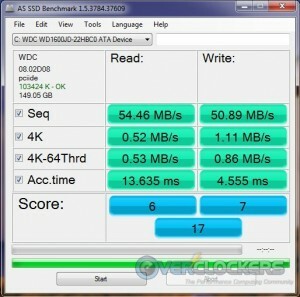 This was the first SSD I’ve reviewed. It was a fun review to complete because, while I had an idea of what to expect, reading can only get you so far. 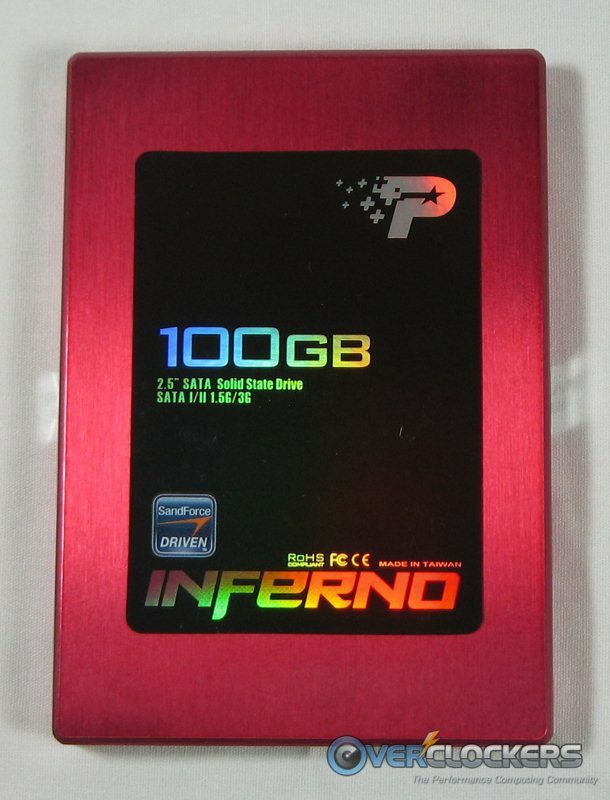 To be blunt, I’m enamored with SSDs now and have been stricken, nay, branded by the Inferno’s fire (proverbially, of course). Not everything was peachy in Patriot-land though and like all products, it does have at least one drawback – synthetically benched sequential reads & writes of random data (say that ten times fast). 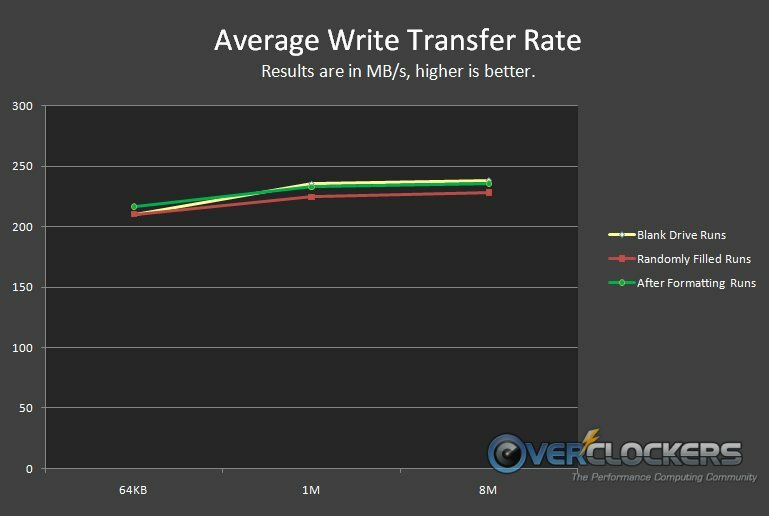 If you plan on using an SSD as a storage drive, with other SSDs that you want to transfer lots of data to and from, perhaps this isn’t the drive for you. 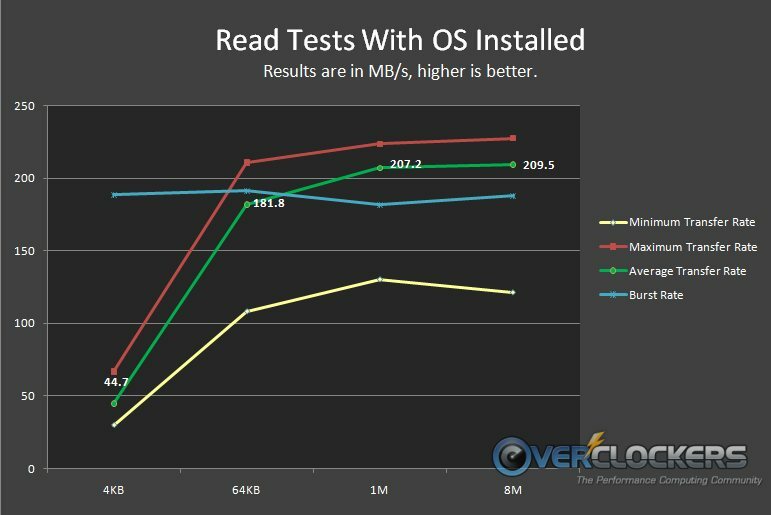 But the 4KB performance is right up there with the best SSDs on the market right now. That’s where the rubber meets the road for most users. Unless you meet the above criteria, this drive has your name written all over it. I’d also be remiss if I didn’t mention Patriot’s superb warranty again – no less than five years. 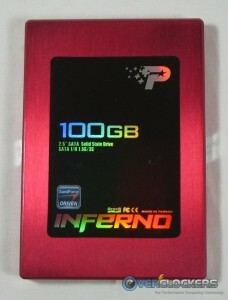 Right now, this drive retails at Newegg for $329.00 shipped. Tack on the current $30.00 mail-in-rebate and you’re looking at $299.00. No, it’s not cheap. Not by a long shot. But all things are relative. It’s closest 100G competitor (at least in specifications) listed at Newegg right now is the OCZ Vertex 2 and it lists at $345.00 after rebate. With the OCZ though, you have to pay for shipping and you get two years’ less warranty. G.Skill’s Pheonix is about $20.00 less than the Inferno, but you lose a little (specified) speed and you lose the same two years off the warranty. There’s a lot to love about the Inferno. 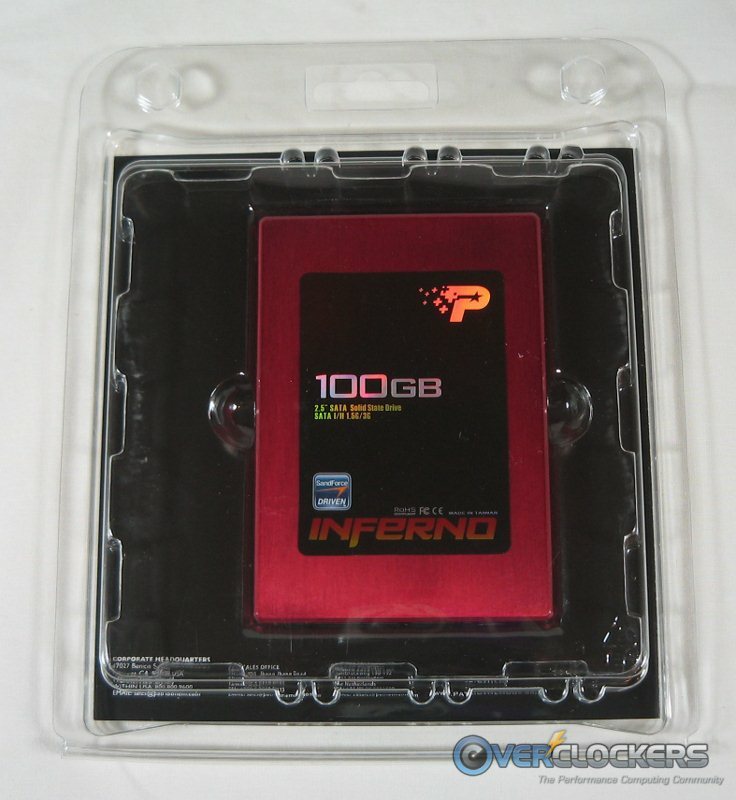 If you’re in the market for an SSD, you know how expensive they are. While its benched sequential numbers aren’t the greatest, it will serve you very well as an OS/Programs drive and do it for at least five years, guaranteed. 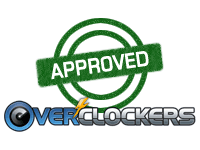 This drive is, without a doubt, Overclockers Approved. 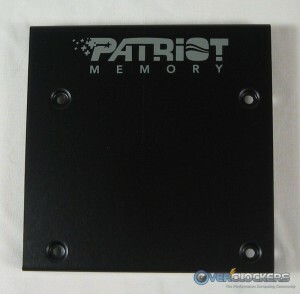 Big thanks to Patriot for supplying this drive for review. Also, how did you get to the IOPS on CDM? 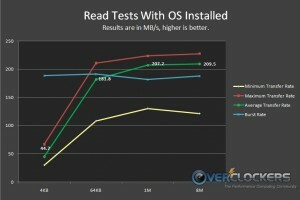 The iops result was from AS SSD, and I don't recall off-hand. Just poked around really; if you can't find it, let me know and I'll run it at home. Even though it's old, it could still be a valid opinion. Glad I included other benchmarks as well (plus they were needed to be thorough). 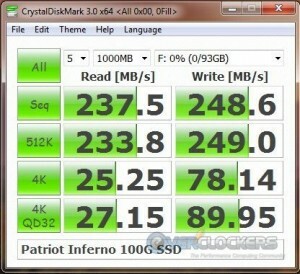 The short of it is, while the tests may not be ideal, there are only a few tests out there for SSDs/HDDs to begin with. I'll probably add PC Mark Vantage's HDD test next time. 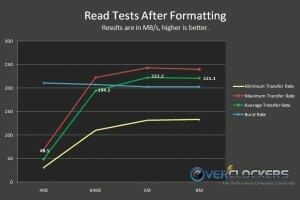 I still think they're good metrics to measure SSDs against each other. Given the same metric across the board, the results should be comparable to each other. At least that's how it works in my head. 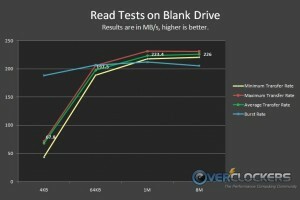 I do think AS SSD & CrystalDiskMark are better for SSD testing, but I still think there is value in the others. The numbers HD Tach / HD Tune came up with were pretty close actually if you look at CDM's 1- an 0-fill results, FWIW. So, are they perfect tests? Maybe not, but I do think there is still value in their use. If nothing else, they would be a good comparison between drives. I will say that there wasn't anything inconsistent about their results though. I could run them until the cows come home and their results were very close to identical every time. In addition to that, Anandtech uses IOMeter, so even though they're older metrics, it seems they have value. Always willing to be wrong though. If anyone has any reason to consider these results completely useless, please share. Lastly, thanks for the kind words EarthDog! About the Anandtech use of IOMeter: they don't use that old 2006 build of IOMeter that everybody else seems to use, but a newer 2008 build, which has, according to the change log, an change to how IOMeter writes data to avoid undesired side effects when benchmarking flash based media, which was submitted by a couple of guys at Intel. 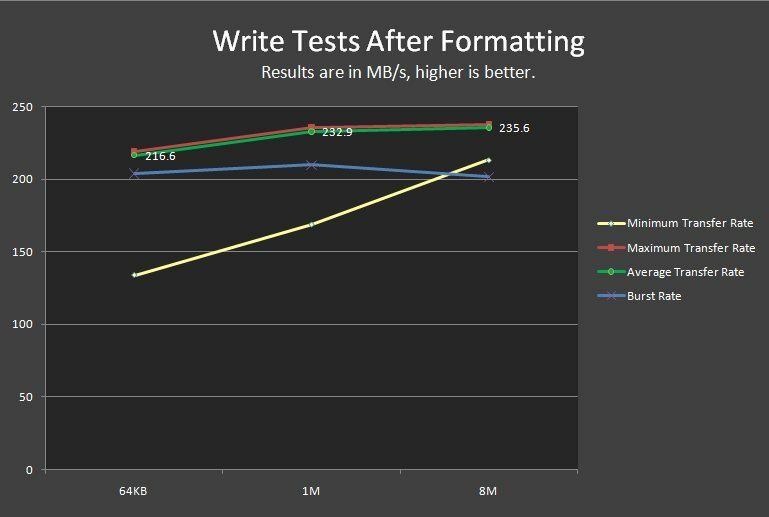 I believe they went even further with SandForce testing and compiled their own version of IOMeter that lets you write randomized data, which matters since the write performance of the SandForce drives depend on data compression. Indeed, that is true; you can get the 2008 build from here: http://sourceforge.net/projects/iometer/files/ . They did mention a custom build as well, you're correct. Unfortunately we have no means to do such a thing at the present juncture. 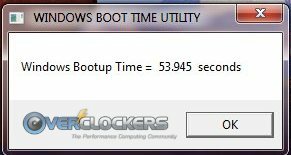 That boot-up time difference was redonkulous. You got only 261 points in AS SSD Benchmark. 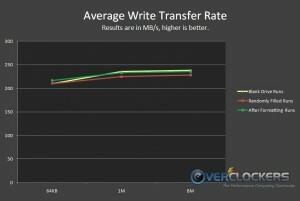 So the SSD is not performing at is best. Set the BIOS in AHCI mode, and take a reinstall. You're absolutely right, I should have tried that. The drive has been repurposed at present b/c I (stupidly) killed my 24/7 Win7 install overclocking a video card for review. When I have a moment I may try switching to ACHI on my existing install and bench the difference. Thank you for pointing out that oversight! Thank you very much, Paul. That means a ton coming from you! 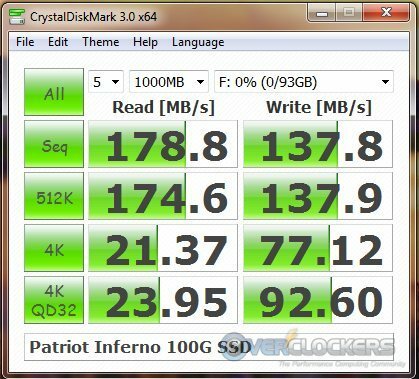 Regarding the ACHI issue, I've re-benched CrystalDiskMark and AS SSD (with an OS installed, and on an ICH10R now). Unfortunately my registry-foo isn't up to snuff and I'm unable to switch to ACHI after changing the requisite keys. This will take some more research, which I unfortunately don't have time to do at the moment. After I get this GPU review out mid-week, I'll try again. When I have a moment I may try switching to ACHI on my existing install and bench the difference. Doing that will give better result , no question about that. If you wan't to get the best possible result from the SSD , you should perform a HDDErase 3.3 before installing the OS (formatting , or doing thing in the registry on the existing install is not good enough). I always make use of HDDErase 3.3 before installing the OS. Instead of installing OS the standard way, I use image. Aye, that's the registry trick I tried and it didn't work unfortunately. Resulted in restarting on bootup (yet oddly still worked fine in IDE mode??). I'll give it another try when I have time though. Your solution is best, but it's not one I can do just now. Bump from the depths! There were two registry settings I had to change, one in CurrentControlSet and the other in CurrentControlset002 (CurrentControlSet001 was already at 0). Anyway; with a full compliment of OS & programs on, the score still improves dramatically with AHCI enabled. Rest assured I will NOT be making that mistake again. 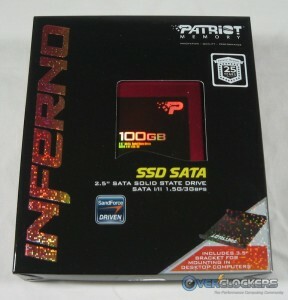 Ladies & gentlemen, I give to you the AHCI enabled Patriot Inferno 100G SSD. I'm going to redo all benches as soon as I have an opportunity to clear out another HDD and ghost this install (VERY busy this week, hoping next week). That's too big of a difference and too large of an oversight to let it slide. We'll do this drive justice yet! 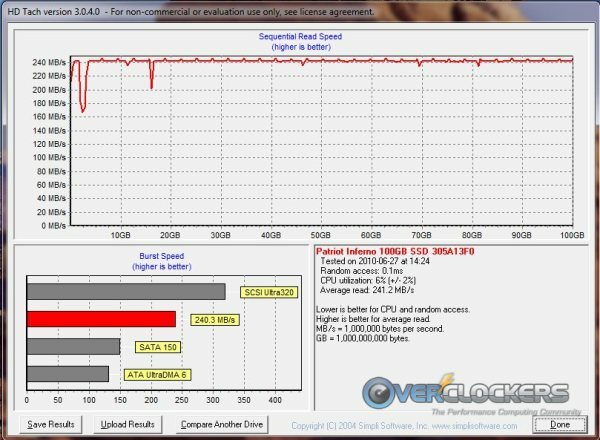 Does anyone know what utility was used to measure boot times in this review? It's something I'd want to try for myself. Thanks. Err...I said ICH10R, didn't I? I meant P55. Fixed above post. I wish I had an ICH10R board! After running a couple benches, it seems the results aren't all that much different after all. It does require some setup knowhow on the AMD side of things though. I'm confused, isn't the SB850 AMD's south bridge? If that's the case, then you should have said ICH10R since it's south bridge on X58/P55.